William IV (August 21, 1765 - June 20, 1837), King of the United Kingdom of Great Britain and Ireland and King of Hanover (June 26, 1830-June 20, 1837, was nicknamed the "sailor king". He was the third son of George III and succeeded his brother George IV. He joined the Royal Navy in 1779 and served in the Americas and the West Indies. 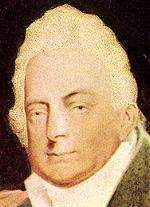 He was made Duke of Clarence in 1789, Admiral of the Fleet in 1811 and Lord High Admiral in 1827. He lived with the Irish actress Dorothy Jordan from 1791-1811 and they had ten children. He married Princess Adelaide, daughter of the Duke of of Saxe-Meiningen, on July 13, 1818, but their two daughters both died in childhood. In contrast to his brother, William was unassuming and discouraged pomp and ceremony although he was occasionally taken to periods of "strange behaviour". While this did little to counteract the generally low opinion of the monarchy, William did not create the embarrassment of his predecessors. His accession to the throne in 1830 took him almost by surprise (his elder brother, Frederick, Duke of York, having died only three years earlier), and he was given to riding around in his carriage making his presence known to the ordinary people - almost like the "walkabouts" practised by today's royal family. As monarch, William played a role in the crisis surrounding the Reform Act of 1832. Initially it appeared that he supported parliamentary reform, even though the House of Lords had previously rejected the Bill in 1831 and 1832. When the Whigs returned to power under Charles Grey in 1831 with an increased majority the King had agreed to create fifty new peerages to force the Bill through but when the Bill came into the Lords the King tried to withdraw from creating the peerages. The government resigned and after an abortive attempt to form a new government around Arthur Wellesley, the Duke of Wellington, the King acceded to the passage of the Bill, setting in motion the transfer of constitutional power from the monarch to parliament. William was also the last monarch to choose a prime minister in opposition to the wishes of parliament; he dismissed William Lamb in 1834 and gave the Tories under Robert Peel an opportunity to form a government. As Peel headed a minority in the House of Commons it was impossible for him to govern, and the Whigs returned to power in April, 1835. King William IV died on June 20, 1837 and is buried at Windsor Castle. His death without a legitimate male heir separated the rule of England and Hanover. His niece Victoria ascended the throne of England, but was barred by Salic law from ruling Hanover, which passed to William's brother Ernest, Duke of Cumberland.